Last year I went on holiday to Porto, the second largest city in Portugal and home of port wine. A friend that I met through my MA journalism course was getting married not too far away and a group of us from the MA course decided to make a holiday of it. We didn't all arrive and leave at the same time, but we all overlapped enough to meet up most days. I was staying in an apartment with Alice and we were just across the street from Julie, who happens to be my flatmate and colleague. Every morning I would go for breakfast with Alice and Julie at one of the local cafes. Breakfast usually consisted of a small cup of strong coffee with a pastry of some kind. 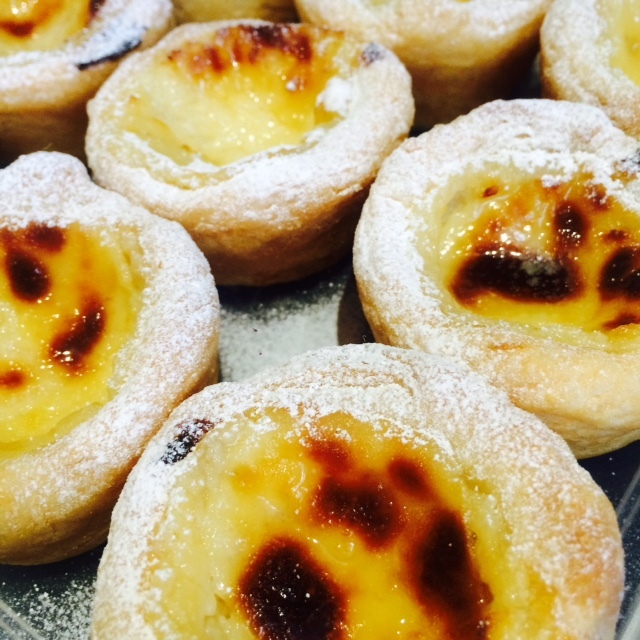 Alice and Julie were on a mission to try as many Portuguese custard tarts (pasteis de nata) from as many different cafes as possible. I tried a few, but I preferred brioche for breakfast, because I could dip it in my coffee without flaky pastry crumbs falling off and choking me when I drank my coffee. But I couldn't deny that the nata were good. Made of a silky custard filling encased crisp puff pastry and often lightly browned on top, these pastries were best served slightly warm and dusted with icing sugar. After our tans had faded and we'd finally got the sand out of our summer clothes, the memory of the nata lingered on. Many a time I have thought aloud that I should have a go at making nata. If Julie happened to hear me thinking aloud, she agreed enthusiastically. So for her birthday I presented her with a voucher redeemable for a batch of nata. When I say voucher it was actually a post-it with a picture of a nata drawn on it. Julie's birthday was in July, so I was running a bit late by the time I made the nata. But I think they were worth the wait. They were even worth making puff pastry. But if you don't want to make puff pastry, just buy a sheet, it's sold in all good supermarkets. The puff pastry recipe will make 500g puff pastry, but you'll only need 300g for the nata. The rest can be frozen and then thawed for use later. 1. Cut off 50g of the butter and cube it, then add to the flour. Rub together the flour and butter with your fingertips until the mixture resembles crumbs. 2. Slowly add the water and lemon juice, stirring it into the flour mixture with a round bladed knife or spatula. You may not have to use all the water. Stir it until it begins to come together as a rough dough, then knead into a ball with your hands, wrap it in clingfilm and chill for 15 minutes. 3. Lightly flour both sides of the remaining butter, then put it between two sheets of clingfilm. Beat it with a rolling pin until it is about half the original thickness, then fold it in half and repeat until it is pliable. It should still be cold. Beat it into a square with sides about 13cm long. 4. Roll the dough out on a floured worktop in four directions to make four flaps with a square about 15cm across in the middle. Place the butter in the middle. 5. Fold the dough flaps over the butter and seal by lightly pressing on the flaps with the rolling pin. 6. Turn the dough over and roll it out away from you into a rectangle about 54 x 18cm. Then fold the dough into three by folding the bottom third up to cover the centre third, then fold the top third down to cover the other two layers. Lightly press the open edges of the dough with the rolling pin to seal them. 7. Turn the dough 90 degrees anticlockwise so the folded edges are to the left and right, roll the dough out into a rectangle and fold it in three again. Wrap and chill for fifteen minutes. 8. Repeat steps 6 and 7 twice, making sure to chill the dough in between and then repeat them once more before using. Now for the fun part - the tarts! You might even want to make the custard before the dough to give it time to cool, it's up to you. This recipe makes 12 custard tarts. 1. Grease the cupcake tin and preheat the oven to 200C. 2. Whisk together the egg, yolks, cornflour and sugar in a pan and mix well together then add the milk a bit at a time until you have a smooth mixture. 3. Put pan on medium heat and stir constantly until it thickens and begins to boil, then remove from heat and stir in vanilla. 4. Put custard in bowl to cool and cover the surface with clingfilm to stop a skin forming. 5. Roll the pastry out to a rectangle around 26cm by 40cm, then cut it in half and stack one sheet on top of the other so it measures 26 cm by 20cm. 6. Brush the pastry lightly with water and roll pastry tightly from the long side into a log. Seal the edge by pressing down with the rolling pin and maybe run a wet a finger along the edge and press down if it is still not sealed. 7. Cut 1cm off each end of the log, then cut the log into 12 evenly sized rounds. 8. Roll the pastry rounds into discs about 10cm across, then put them into the cupcake tray, using one off the offcuts to press the pastry into the corners. 9. Divide the cooled custard between the pastry cases. 10. Bake in the oven for 25-30 minutes until the pastry has expanded and is golden brown and brown spots are forming on top of the custard. Done! They are best eaten that day, but if you can't polish them off that day, a minute or two under the grill will only improve them.